Literate Jacksonville DJ just talking to himself. What do I do in my spare time? 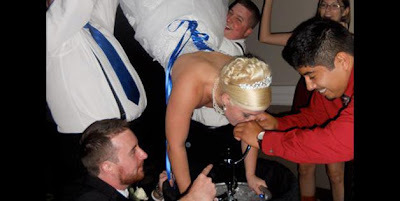 I search for goofy wedding stories to share on my blog here for no one to read! 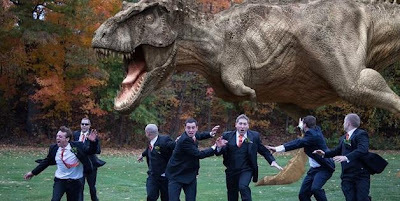 So, while you're not reading, feast your eyes on these wedding pictures from couples who clearly have an overdeveloped sense of humor. The original article is from MSN and features all 17 pictures. I just wanted to share a few of my favorites. 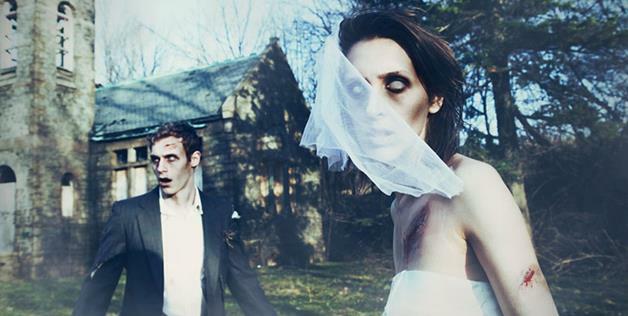 Who doesn't love a good zombie wedding?! You're welcome. Feel free to check out the original article with the rest of the shots. Skip Kelly Productions has earned an "excellent" review rating on Google, won the 2012 & 2013 Wedding Wire "Bride's Choice" Award and was voted "Best of Jacksonville" in 2013 & 2012 by the readers of Jacksonville Magazine. This past year, Skip was chosen as the Music Director for Jacksonville Fashion Week, and hosted multiple events for the Belk department stores, Fox 30, Sephora, Massage Envy and CBS47, to name just a few. Now settled in Jacksonville, FL and married to celebrity makeup artist Paulina Perez, he is bringing his unique, top-level experience to the local entertainment scene. If you are looking for a Jacksonville Wedding DJ, or a DJ for your special event, visit http://skipk.com for more information.